Welcome to a new series on Life Goals Mag called Blogging Meets Biz. I’m a big fan of learning from bloggers and business women about how they got where they are now, how they fuel their creativity and productivity, and how they write great content. Starting off this Blogging Meets Biz series is Angela Hamilton. I was personally fascinated by Angela because of the variety of projects she manages and does an excellent job with. Do you ever come across a Twitter bio that makes you think, “Whoa. Cool. I wonder how she does it all.” That was Angela to me. So I reached out and asked for an interview with the lovely girl. I hope you all enjoy! Tell us about yourself and what you do for a living & where you blog. I’m a freelance writer, editor, & blogger. My lifestyle blog is if found, make. and it’s home base. I also co-write The Blog Market, as well as freelance for a wedding blog and serve as a digital content editor for a boutique LA-based agency. I’m a big crafter too and up until recently sold my crochet accessories and vintage fashion on Etsy. I majored in English in college and planned to get a writing job afterward, but I had no idea how that would turn out. 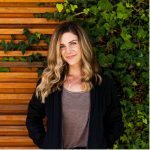 Months after graduating and living in my hometown in WA, I landed a job as an assistant editor at a Los Angeles digital agency that managed lifestyle blogs. I only worked there for 6 months before it went under. I actually got what I thought was a great new editor job quickly after, but within a month I knew it wasn’t for me. So I took a leap and went the freelance route kind of by necessity… I applied to some jobs and hadn’t found the perfect fit, so I built up my portfolio over the next few months until it was finally full-time. Luckily, I landed two great long-term jobs that I’ve been at for over a year and a half now in addition to the two blogs I write. Working from home, I’ve spent a lot of time trying to create structure where it simply doesn’t exist. But lately a typical day includes writing a super long, very detailed to do list and prioritizing it. I keep it detailed because it gets everything out of my head and on the paper. I force myself to go through it by priority—otherwise I’ll do whatever’s easiest. While each day includes different tasks—some days I focus more on social media, writing, photography, or getting through email—my flow of work is pretty similar day-to-day: a few hours of work in the morning, followed by a short break, then work until lunch, and trying to get back into work after lunch, which is hardest for me! I usually have to get out of the house because fighting that 3pm nap urge is rough! Do you have any tips for managing multiple projects? Any tools/apps you use? Honestly, I’m very old school when it comes to managing my workload. I use a notebook to create my to-do. My planner is mostly used for tallying up hours spent on projects. I create folders/documents on my desktop for all the projects I have to do that day or week and as I complete them I put them in the appropriate place or upload them to WordPress. I use Google calendar—I have several different calendars and four inboxes I regularly check. That’s about as technical as it gets with me! I’ve tried apps and I know so many people recommend them but I just end up organizing on paper anyway, so it ended up being repetitive. How do you find inspiration for your content for the days where you have a creative block? I’m a believer in taking breaks when they’re needed. We all work way too hard. I find that when my creativity is drained it’s because I’m not taking care of myself. I’m trying to multitask or I’ve said yes to too many things and I feel burnt out. So if I can take a break, it restores that inspiration and I find myself naturally brainstorming new ideas. But if I can’t take a day off, which is often the case, I find that an early morning walk almost always does the trick. When you’re like me and have a lot on your mind, it’s amazing how long you can just walk aimlessly sorting through all your thoughts! Once I’m more mentally organized, I notice that my head is more clear/open to inspiration. Overall, getting off the internet inspires me most. I love Pinterest but when I’m uninspired, social media and blogs just overwhelm me. I need to read a book or try a new craft, or like I said, get outside. This leads to new content ideas. What’s your favorite post you’ve written and why? Actually I wrote a post on The Blog Market not long after we launched about old school ways to find inspiration. It talked about exactly that. I also recently just shared a post on if found, make. that’s more like a personal essay about San Francisco, along with photos of a recent trip. Even though it wasn’t a typical post full of tips or advice, I felt like it helped readers get to know me better. I’m always talking about travel and San Francisco—now people have a point of reference to associate with all my photos. Sometimes what you like the most isn’t always what resonates with the masses… I think it’s important to find a balance, or you may end up just writing/posting about things you don’t truly believe in. What are your best tips for creating great content? 1. Content is not just about the text you write in the blog post, but an entire package including the article, the photos/visuals, and the social media or way you promote it. Think about each of these elements when pursuing your subject. 3. Make time to listen to your audience. Whether it’s emails, comments, who’s retweeting and repinning your stuff, this will let you know what’s sticking. Don’t base everything off this, but make it a point to listen and adjust accordingly. Some advice I’ve received and am kind of going with right now is to just try everything and see what sticks. As a freelancer you have the opportunity to do so many different things—especially with writing—so what I’m working on fluctuates and evolves. All that said, you can find me on my two blogs, as an editor at Funk Digital Media, on Instagram, twitter, and Pinterest. You can follow along with Angela at if found, make. and the blog market. Let us know what your tips are for creating great content in the comment section below! All photos taken by Angela Hamilton. Thanks so much for including me in your series, and congrats on the launch! I’m having a great time looking through the articles up so far and your mission really resonates – happy to be a part of it!